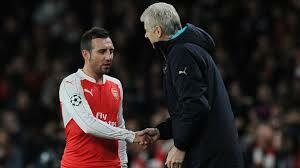 Santi Cazorla has come to the defence of the fans as he says they have every right to be angry with the club. The Gunners have recorded some annoying displays so far this season and the most heartbreaking result came against Bayern Munich in the Champions League. The 5-1 bashing from the Bundesliga giants didn't go well with fans who directed their criticism to the players and most especially the manager. Cazorla when asked of his view about the outcome of that game and the reaction of fans said: "Yeah, well (they were annoyed) with good reason, right? "We had a lot of hopes for the Champions League and now it’s tougher to stay in. But it was all in the second half, in the first it was good. We had good possession, then Bayern scored and we had a few opportunities in the first half but that second half was bad. "Bayern scored four goals so its normal for fans to be mad. First, we are annoyed with ourselves and of course the fans (are right to have) expected more from their team."